The documentary film about my life and music will be screened at a theater in New York City on Wednesday, September 20, 2006; in addition, I will be in New York for two live performances a week and a half later, on Saturday, September 30. Below please find information about event locations, times, program content, and how to buy advance tickets. Special deal: buy tickets to both 3 pm and 8 pm concerts together for $34 ($6 discount). The recent documentary film “Beyond 88 Keys,” profiling the life and music of pianist Michael Arnowitt, will receive its New York City premiere on Wednesday, September 20. Michael Arnowitt will perform two live concerts on Saturday, September 30, a matinee concert of classical piano music followed, after a dinner break, with an evening duo jazz concert of improvised music with the tenor saxophonist John McKenna. “Beyond 88 Keys” explores Michael Arnowitt’s diverse interests in music, from Bach, Beethoven and other greats from the past to contemporary classical composers, jazz improvisation, creativity in program construction, and the social and historical contexts of a piece of music. The film also touches on Arnowitt’s sympathies for political activism and his reflections on the challenges of being legally blind from a progressive retinal disease, retinitis pigmentosa, he has had from birth. The film screening will take place at “The Anthology,” Anthology Film Archives, 32 2nd Ave. (at East 2nd St.), on Wednesday, September 20 at 6 pm. Tickets are $5 at the door. The event is sponsored by the New Filmmakers Forum of the Angelika Film Center <www.newfilmmakers.com>. The filmmaker Susan Bettmann will be present at the screening. Information: 802-223-5124. Michael Arnowitt will perform a new classical piano solo program, “The Ice Cream Cone,” on Saturday, September 30 at 3 pm at Lang Hall, Hunter College (North Building), East 68th Street between Park & Lexington Avenues. The program is titled “The Ice Cream Cone” for its unusual V-shape chronological progression: the first half starts with music of today and progresses gradually backwards in time 400 years; the second half of the program reverses course and progresses forward through the centuries, ending back at music composed in our times. Composers represented on the program are Bach, Brahms, Byrd, Ligeti, Takemitsu, Scarlatti, and Debussy. 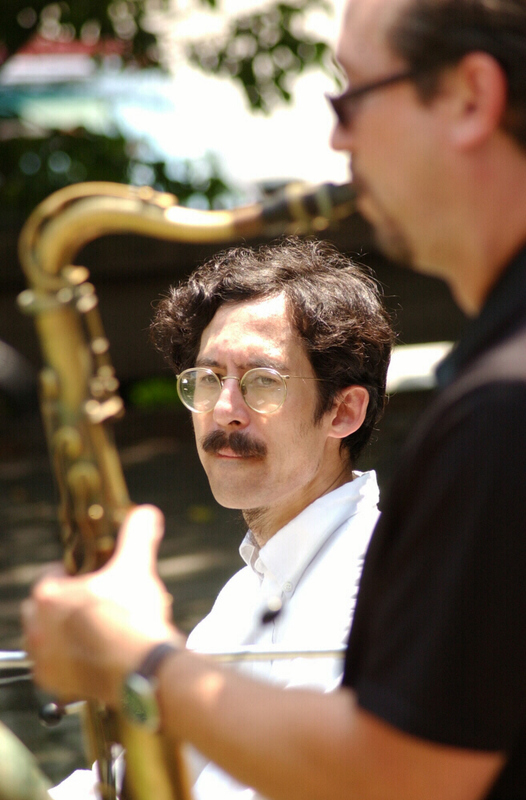 After a dinner break, Michael Arnowitt will at 8 pm switch hats and enter the world of jazz with a duo concert of improvised music with the tenor saxophonist John McKenna. The program will contain a mix of originals, free improvisation, and tunes from the performers’ favorite jazz musicians of the past. Saxophonist John McKenna has a strong, sonorous, and expressive sound in the post-Coltrane tradition. He has toured the U.S. and Europe with Joe Lovano’s Celebrating Sinatra Band, recorded and performed with organist and pianist Larry Goldings on compact discs for Warner Bros. Records and the St. Paul, Minnesota based IGM Records, and has also recorded for the Koch and Omnitone labels. John McKenna has performed in concert in California with the Red Rodney Quintet and at the Museum of Modern Art with the Ron Horton Quintet. He has also performed with jazz musicians such as Larry Grenadier, Victor Lewis, Peggy Stern, Kurt Rosenwinkle, Ben Allison, Branford Marsalis, and Jane Ira Bloom, and for ten years was on the faculty of the Stanford Jazz Workshop on the West Coast. Admission to the 3 pm classical concert is $21, the 8 pm jazz concert is $19; student tickets $10. Tickets to both concerts may be purchased for a discounted total price of $34. Tickets are available at the door or in advance through the Kaye Playhouse Box Office, 212-772-4448, < http://kayeplayhouse.hunter.cuny.edu>. Detailed concert program information is located at: <http://www.mapiano.com/nyprog.htm>. This past October, Michael Arnowitt performed in Europe for the fifth time, giving a five-week concert tour in the countries of Russia, France, Belgium, Germany, Holland, and the Czech Republic. He has twice performed as piano soloist with the Boston Symphony Orchestra and has also appeared in concert with the Kiev Chamber Orchestra, the Ying String Quartet, the Canadian percussionist Beverley Johnston, and the photographer-author Marjorie Ryerson, with whom he presents “Water Music,” a special multi-media program about the element of water which combines live music, projected photography and spoken writings about water commissioned from famous musicians of today. Michael Arnowitt is considered one of the most creative and imaginative pianists in today’s classical music world. He is best known for the beauty, clarity and elegance of his musical ideas, for his abilities to find new articulations and colors from the piano, for his talents in constructing innovative and thought-provoking programs, and for his natural and warm on-stage manner with audiences of all ages. His new programs include A Trip Through The Four Seasons, a concert voyage through the calendar year, featuring some of the best music ever composed inspired by our experience of spring, summer, autumn, and winter; Music & Letters, a program exploring the literary aspects of our lives, with music about the act of writing, story-telling, speaking, and listening to words, The Composer’s Menagerie, music evoking the qualities of animals, and Ligeti and his Influences, presenting the remarkable new piano �tudes by Gy�rgy Ligeti, plus music by composers who inspired him: Scarlatti, Schumann, Chopin, Debussy, Nancarrow, and jazz pianists Thelonious Monk and Bill Evans. His largest musical endeavor was directing the Vermont Millennium Music Festival, a four-day gala which took place in September 2000, featuring 24 concerts and special events presenting in chronological order music from the year 1000 to the year 2000. This novel festival attracted visitors from throughout the United States and was an extraordinary chronicle of the music and culture of the past thousand years. Michael Arnowitt has five recordings of solo piano music, on the Ursa Minor Records and Musical Heritage Society labels. He has maintained a web-site since 1997 at http://www.mapiano.com, which includes his writings on music. He has lived in Montpelier, Vermont since 1983.